(i) In the “IFC” case, there were rumours that the “deal” was facilitated by a Professor Eddie Ayensu, a Ghanaian with connections to the very top of the Kufuor Administration. In this latest CNT case, the deal is rumoured to have been put together by another Ghanaian with connections to the very top of the Kufuor Administration. The NDC Position 45. It is true that the NDC MPs also voted for this very suspicious loan. However, following concerns expressed from several quarters, including even from within the NPP itself and the 'Ghana Palaver' publication of Friday, April 23 – Monday, April 26, 2004, and in line with our belief in the cherished Ghanaian philosophy of “sankofa”, we find nothing wrong in going back to do the right thing when you realise you may have been wrong. 46. I wish to repeat what I stated on behalf of the Party at our Press Conference of 8th July 2002 on the “IFC” scam loan: “The NDC must not be misunderstood to be seeking to thwart the effort of the NPP Government to secure a loan for infrastructural and development projects. Far from it. On the contrary, we are seeking, through this exposure, to protect the sovereign interest of Ghana from the schemes and scams of international fraudsters and crooks. The so-called loan agreement is not at all in the interest of Ghana. It is a 'scam”, and somebody somewhere is out to dupe the country”. 47.That remains our position on this CNT loan. Conclusion 48. Once again, we call on the Institute of Economic Affairs (IEA), Centre for Policy Analysis (CEPA), Ghana Institute of Management and Public Administration (GIMPA), the Economics Departments of our Universities, the Law Faculties of our Universities, the School of Administration of the University of Ghana and other research institutions of economics and finance to undertake a dispassionate review of the loan agreement and the supporting documentation and advise the NPP Government accordingly. 49. This is not about partisan politics. This is about what is in the supreme interest of Ghana. Even though Parliament has approved the Loan, it is not too late to recall it for review. 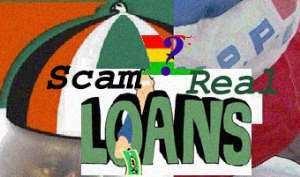 We are convinced that the deal is a “419 scam” very similar to the infamous” IFC loan scam”. 50. Finally, we call on President John Agyekum Kufuor to act by suspending the loan transaction before it is too late.